Cologne 2010: at imm Cologne earlier this month French designer Julien Renault presented a collection of aluminium furniture made with forging techniques normally applied to steel. 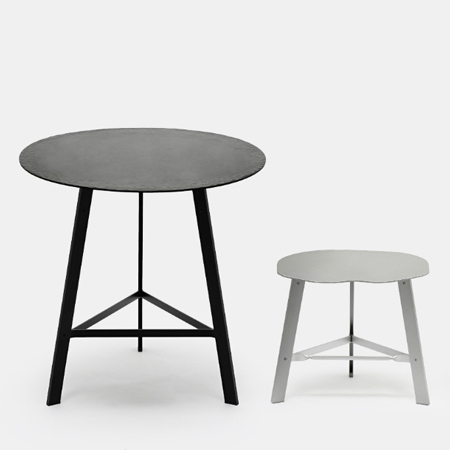 Called Hand Forged, the lightweight stools and tables are sand-blasted and anodised. The project was one of three winners at this year's [D3] contest at imm Cologne. See the other winners and exhibitors in our earlier story. We’ll post the movies from the Dezeentalks soon, including Renault interviewed by Dezeen editor-in-chief Marcus Fairs. See all our stories about Cologne 2010 in our special category. This project is inspired from the art and work of forging steel. My objective was to source inspiration in these archetypal processes and techniques and apply them to aluminium, a more contemporary and suitable material. The result is a series of surprisingly lightweight and versatile objects. The project results in a family of items that associate standard aluminium extrusions with elements made using forgery skills and details. The use of aluminium enables anodisation, a durable and appropriate surface finish. Before this finishing touch, the aluminium parts have been sand gritted in order to obtain a rather rough texture, emphasizing the surface qualities usually found in steel. These objects are a dialogue between industry standards and near-craft techniques, mixed into one-another in order to obtain durable, comfortable and insightful products.